One of the few things I dislike about living in Oxford is the lack of a decent indoor climbing centre. Oh how I miss the Castle! As a result, I don't really climb any more, other than occasional visits when in London. 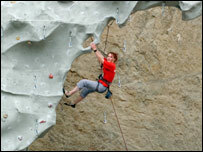 Meanwhile, back in Scotland the world's biggest climbing centre, set in a disused quarry, has just re-opened. It's had lots of financial and building problems, but if it's as popular as the Castle is (queues for every route - annoying, but a sure sign of the centre's popularity) and it caters for climbers of all abilities (apparently it was aimed at more experienced climbers at first - the biggest market for such a centre is surely the "social climber" i.e. the sort that experienced climbers dislike), then I'm certain it will be a success. Public transport access may be important. I;m not sure where it is exactly and how accessible it is, but they are hoping to get a direct bus service. The Castle is easily reached by bus of Tube. Maybe they should run a mini-bus service if the centre is isolated? Cheers. I knew it was in the Edinburgh area but figured it would be some distance from the actual city (what with it being in an old quarry and all). If it can only be reached by car then that's not so great.